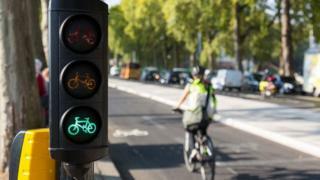 Businesses in east London are losing £5.3m a year due to traffic delays because of a cycling superhighway, a report has found. As part of the East West Cycle Superhighway, an eastbound lane of traffic was removed to make way for a segregated two-way cycle track between Tower Hill and Lancaster Gate. Some 400 working hours are being lost a day, the transport report claims. The mayor's office said the route was a success and would not be changed. The report on the route, which opened in 2016, by transport economists Volterra was commissioned by Unblock the Embankment - a pressure group comprised of road organisations and the black cab trade. Chris Westcott from Royal Jersey Laundry said the company had to hire extra staff to ensure its deliveries to 55 hotels in central London were completed on time. A journey which used to take 45 minutes was now taking more than an hour which made it difficult for them to make their delivery time slots, Mr Westcott said. He added it had "cost the company a fortune, circa £110,000 a year". But Fran Graham from London Cycling Campaign said the cycling superhighway had been a success. "We need to get more people cycling and walking and the cycling superhighway is how to do that," she said. Will Norman, of London Mayor's walking and cycling commission, said the route would not be moved. "We know that having walking and cycling facilities encourage footfall to our high street shops, but we also know it's absolutely critical to the continued investment and retention of big business to our city because the workforce want to walk and cycle more." Tony Halmos, from Unblock the Embankment, said although £5.3m was "not a vast figure for all the myriad things that affect London", the health improvement was nonexistent. "If anything, things have got slightly worse as the congestion means more pollution," he added. Transport for London has not commented.